It’s a question on so many minds: what will the future of education look like? 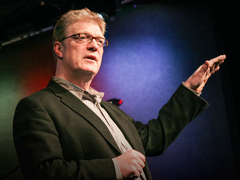 Sir Ken Robinson: Do schools kill creativity? It’s something Sir Ken Robinson has asked for decades. And tonight in Session 3 of TED2013, Robinson got the opportunity to announce the winner of the 2013 TED Prize, someone who has a bold answer. 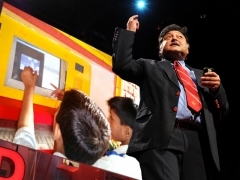 And with that, he revealed the winner of the $1 million TED Prize: education innovator Sugata Mitra, who has given two TED Talks over the years and released a TED ebook called Beyond The Hole in The Wall. We can’t imagine the technology of the future, and thus we can’t know what jobs we’ll need the skills for. So Mitra suggests that education should be about developing the ability to learn anything on one’s own. Mitra has a history of research to back up this wish. In 1999, he began what he calls his “hole in the wall” experiment. He carved a hole in a wall in a Delhi slum — about three feet high — and placed a computer in it. Kids had gathered around within a matter of hours and asked Mitra questions about what this thing was. He responded “I don’t know,” and walked away. Soon the kids were surfing the internet — and teaching each other how to do it more effectively. Mitra kept testing, seeing if rural students could learn different pronunciation simply by talking into a speech-to-text engine until it understood them. They did it. And then he went even more absurd. He asked: Can Tamil-speaking 12-year-olds learn the biotech of DNA replication by themselves on a streetside computer in English? Sugata Mitra: Kids can teach themselves Slowly but surely, over months, the kids began to learn the material — showing understanding of concepts far advanced for their age. In three months, with a test, they went from 0% comprehension to 30%. But Mitra wanted to see if he could go further. He brought in a 22-year-old woman with no knowledge of the subject to tutor the kids, using “the method of the grandmother.” Instead of traditional instructing, she simply gave encouragement. The kids’ test comprehension scores jumped. Mitra isn’t ready to say that, but he is willing to challenge traditional modes of education based on teaching, testing and regurgitation. As Mitra explains, punishments and exams are seen as threats by kids. He says that these are tools no longer needed outside of the age of empire. Mitra urges us all to shift the incentive for education from threat to pleasure. Mitra shared another one of his experiments — the “granny cloud,” a community of retired teachers who Skyped into learning centers and encouraged children with questions and assignments. He calls this type of environment a SOLE — a self-organized learning environment. It’s based on a curriculum of questions that set curiosity free, varying forms of peer assessment and certification without examination. Mitra’s $1 million TED Prize is not a gift– it’s seed money to fund a global initiative toward this vision. The money will help Mitra break ground on the School in the Cloud in India this very year. This school will serve as both an education and research center to further explore approaches to self-directed learning. It will be managed by cloud technology, but with an adult supervisor always on hand. The plans for the school will be open-sourced. But Mitra is asking for your help, too. He has released a toolkit for parents, educators and teachers who want to create SOLEs. The online resource will help them support kids (8-12 years old) as they tap into their innate sense of wonder. The key: asking big questions. For example, “If a meteroite was coming toward the earth, how would you figure out if it was going to hit?” Mitra has been amazed with how kids come up with new approaches to questions like this. My wife would like to know how to join the Granny Cloud, Is there a link? I got lost trying to find one via Newcastle Uni. Dr.Mitra, I totally like your idea of SOLE. I wish all schools including mine would think like you.I think this is totally creative and the concept of exams is illogical because we don’t learn or understand anything we just memorise facts. we just take in all the facts in our school books like they’re a sacred truth. no other point of view is possible. i wish you luck and hope that your idea really catches up with India’s schooling system. Finally! Now that TED has given such clout to a seriously needed shift, the future of education is here. What Sugata is saying here is going to upset a lot of people because it is true. Student-centered and self-driven learning will drive such an incredible progress in all walks of life. Think of what Daniel Pink has taught us that our economy has shifted from industrial to a more conceptual and digitally connected. 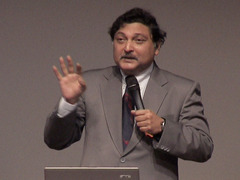 Sugata’s School in the Cloud is brilliant. I can’t wait to be a part of it. Good teachers have always encouraged curiosity and wonder-driven learning, then stepped back as much as possible. The trick will be nudging that curiosity in the right directions, and feeding it to endure such that learners can still absorb coherent bodies of knowledge and build skills. True innovation and creativity often involve taking more routinely-built knowledge and applying it in an unconventional way. In his example of the children who learned English in order to play games, we skipped past a pocket of unobserved learning. How did the game teach them English? Did they practice it among themselves? How much English did they learn? It feels a little like a movie workout montage that whips a character into shape in 30 seconds so that we can see the entertaining results. How did that happen? Learning English usually takes a lot of grunt-work. I wonder whether we are discussing self-teaching here, or self-motivating (which is tough to cultivate in a test-driven environment). If a child learns with a computer or a group of people, is that still self-teaching? Congratulations!! I am very happy with this prize to Sugata Mitra. His work is revolutionary because it comes back to the basics: children learn by themselvs if they have the resources available; curiosity and collaboration between children drive learning. My heart is full of excitment for this prize! So proud I translated one of Sugata Mitra TED talks to my native language (Portuguese)! Pingback: THINK…breath and watch a TEDtalk before you spill your guts‏ | ACT. REACT. or just THINK about it! I recently visited a public high school in Massachusetts where students have created their own self-organized learning environment. You can tell their thinking is very much aligned with what Sugata Mitra describes. The revolution has begun. if we are one hand we will surely have a great success.